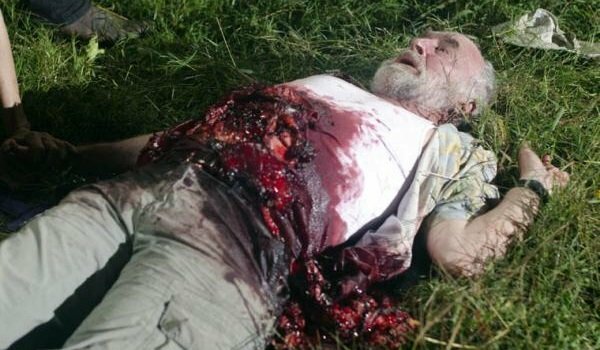 To me, Dale remains one of the only Walking Dead characters that I would have wanted to hang around with for a while. He had a multi-faceted head on his shoulders, and while his quasi-fatherly affection for Andrea and Amy was a little creepy, he was a good guy. Which is why it was so much of a gut-punch when he randomly ended up getting his intestines yanked out of his body by a walker that Carl allowed to roam free, because that’s just how Carl rolled in those days. (All days, really.) It would have been one thing had he died quickly and on the spot, but there was a brief talk about saving him before Daryl takes it upon himself to shoot Dale. I guess no one could really live being THAT disemboweled, but it would have been nice for him to try, dammit.